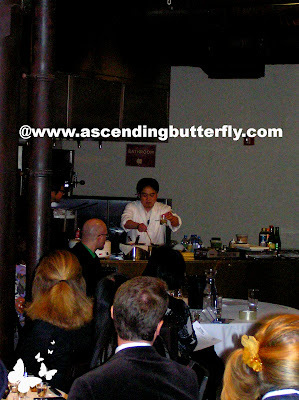 Last week I had the opportunity to attend a very fun event at Astor Center in New York City, a SAKE tasting! 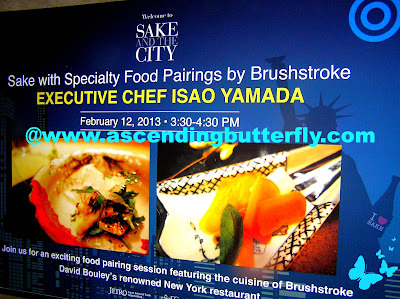 I had the chance to attend not just the walk around tasting that was open only to media during the day and then opened to the public in the evening, but I also attended two seminars where I learned so much about SAKE and about creative food pairings that go beyond Sushi! My mom introduced me to SAKE and I introduced her to Sushi, so we attended the SAKE And The City Event together and had so much fun! 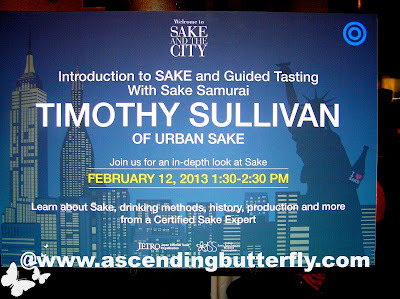 We started with the first seminar which was an Introduction to SAKE and Guided Tasting with Sake Samurai Timothy Sullivan of Urban Sake! If only I had known YEARS ago that my love of SAKE could have been turned into a job with such a fun and funky and job title! The crowd was definitely excited! 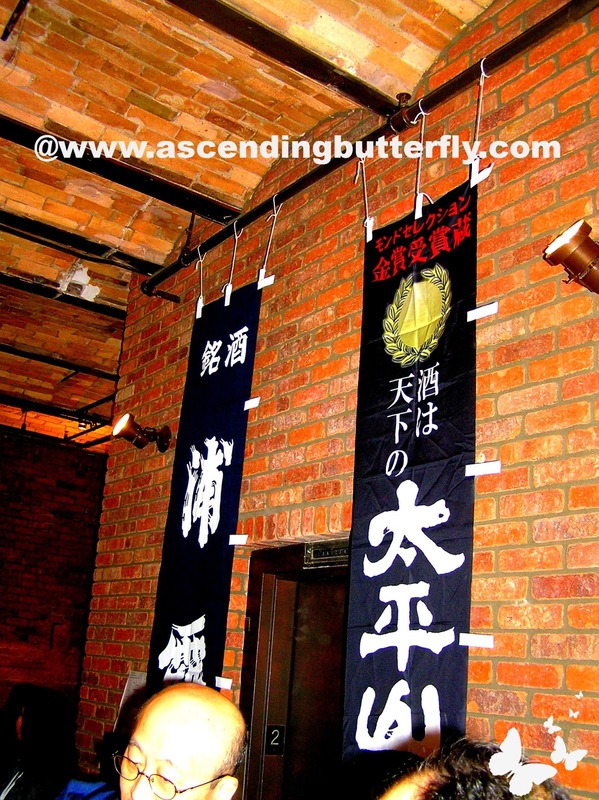 We then moved on to the Classifications of SAKE, they fall into either the 'Fortified Style' or the 'Pure Rice Style' this chart can be read in detail HERE. He then discussed the fermentation process of Sake, which brought me back to my tour of the Bacardi Rum Factory in Puerto Rico when the tour took us through the fermentation tanks! Everyone was excited for the tasting part of course! I had to snap a shot of the bar that also showed the pictures of the bottles of the SAKE we tasted! 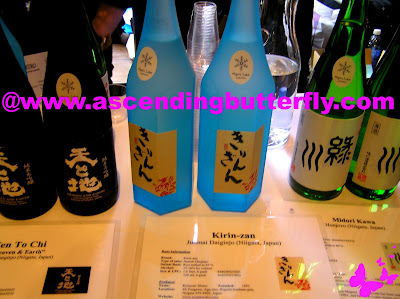 I loved the color of the bottle, and found the Kirin-Zan SAKE to be a mild and mellow SAKE I would definitely serve! There was time before the next seminar and we hit the walk around tasing room! I wasn't able to get pictures of every single SAKE so I tried to nab shots of the ones I really liked best from each table. 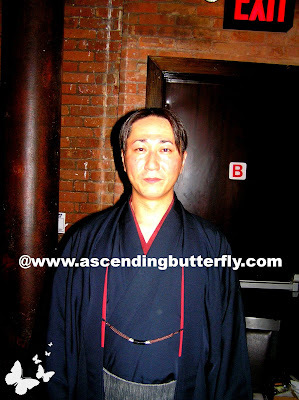 The Kirin-Zan pictured above was my favorite from the first table I visited. I learned in the seminar that some SAKE is meant to be served warm and others should be served chilled. The Aronia Nigori, the pink bottle on the far left that is in the ice bucket was my next standout SAKE. This SAKE is meant to be served chilled, and there was a refreshing crispness to this one that I greatly enjoyed! After trying the Aronia Nigori, I followed the signs to the next table! 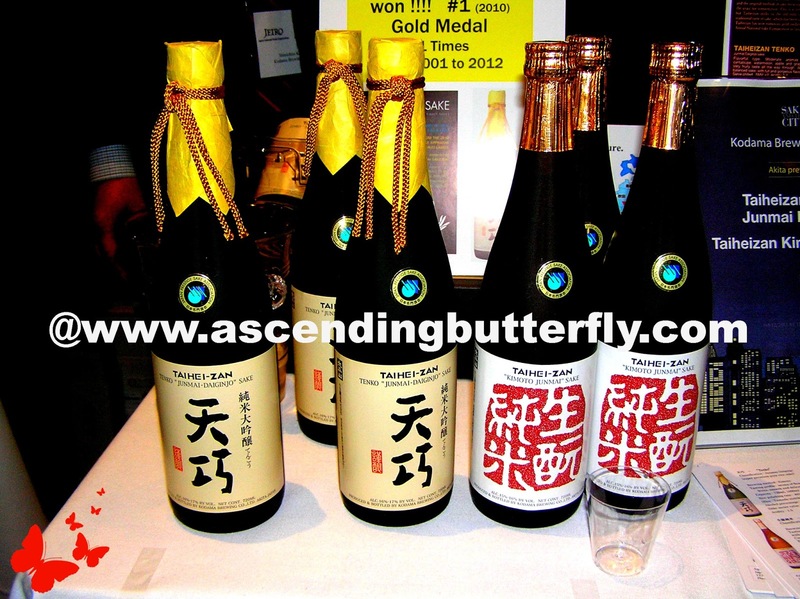 This SAKE is an Award Winner! And I definitely appreciated the enthusiasm in which it was presented! This was a very flexible SAKE and I can see keeping it in stock at home because it's quite balanced on the palate! 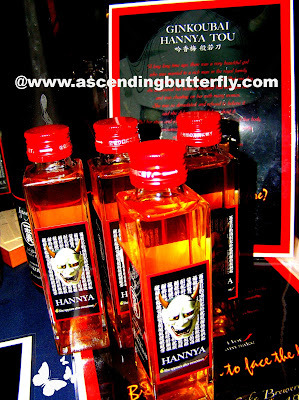 Ginkoubai Hannya Tou Plum Sake - THIS WAS OUR HANDS DOWN FAVORITE OF ALL THE SAKE WE TASTED! We were hearing some major compliments at this point (which was about the mid-point of the tasting) regarding a Plum Sake that was a must try, in fact someone standing next to us asked us if we had tried it yet and we hadn't. He literally walked us over to this station and boy am I ever glad he did! Plum SAKE is actually already a personal favorite of mine, but this is one I had not yet tried. Hannya is this un-expected burst of Plum SAKE with a literal burst of peppery flavor, it's a bit of spice and heat that you don't expect it to have, and while you can certainly pair it with a meal, it's also one I can see you wanting to enjoy on it's own. This one was our hands down favorite, and apparently everyone else's too because when we visited Astor's Cellar later on to purchase it, it was already sold out, and I can tell you I fully understand why! This one is my super standout pick of the entire day, hands-down! What was also fantastic is that they took so much time with us to show us a photo gallery of their brewery, and they were super personable! And if it's true that someone's passion and enthusiasm can actually be tasted in the final product be it a meal or a rice wine, then you can definitely see this is true with Hannya, they love what they do, you can truly taste it and it really shows! After finishing up with Hannya, we realized that we lost track of time and it was time for the second seminar of the day! The second seminar was the SAKE with Specialty Food Pairings by Brushstroke Executive Chef Isao Yamada and it was fantastic! It took us beyond the obvious which is SAKE and Sushi and challenged us to be more creative with how we pair SAKE with food. That salad was delish and so was the SAKE it was paired with! 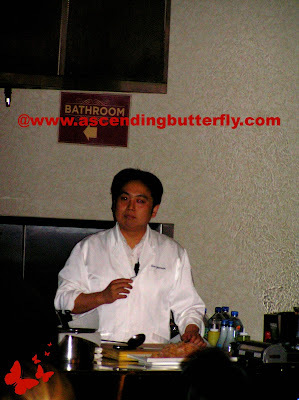 We got to watch as the Chef prepared each dish before and then we were presented with the dish to taste! This was definitely the most un-expected pairing, I wouldn't have thought a jerky type of meat would have paired so well with a SAKE but I was wrong! 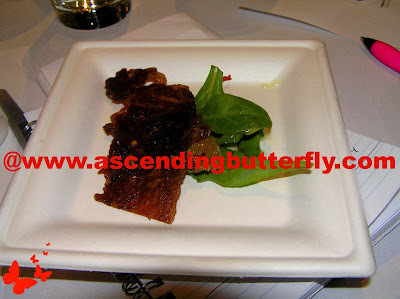 I loved that the pairings went beyond the Sushi and SAKE mindset and challenged us to be a bit more creative and adventurous. 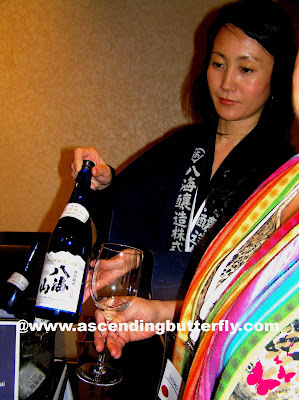 We got to pair the perfect Sake for the food that was prepared! 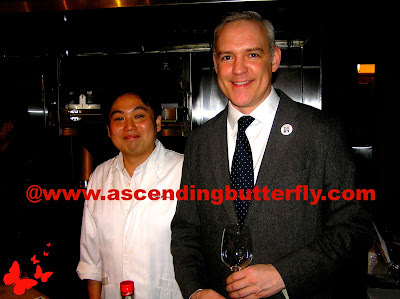 Below: I asked Timothy and Chef Yamada to pose for a close up and they kindly obliged! After the last seminar we went back to the tasting to try hit some of the stations that we missed. 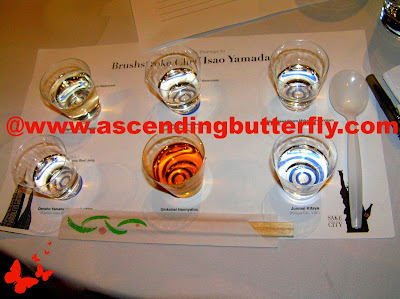 I greatly enjoyed SAKE And the City, I enjoyed trying SAKE brands that were new to me and discovering new favorites to add my list. I learned a great deal about SAKE and appreciated the panels by Timothy Sullivan and Chef Yamada greatly. 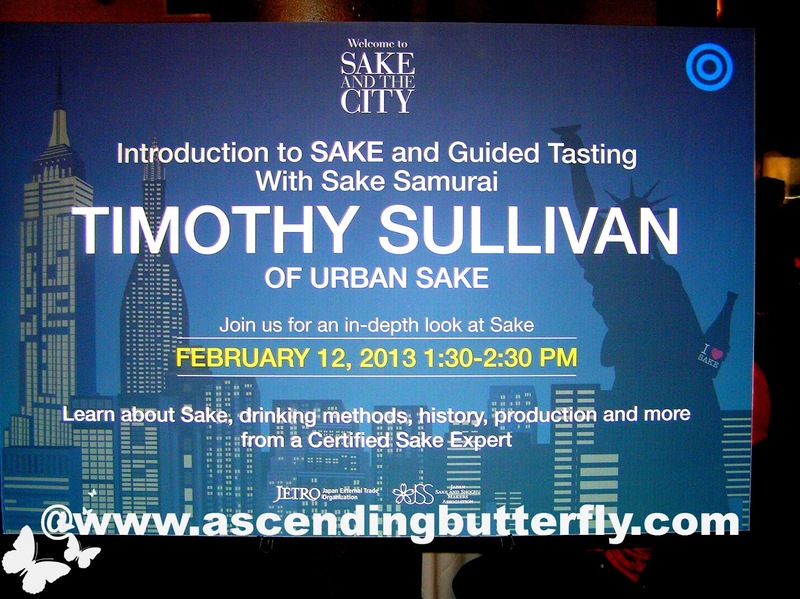 Whether you are a SAKE expert or a novice this tasting definitely had a little something for everyone! I certainly hope that the Japan External Trade Organization (JETRO) and the Japan Sake and Shochu Makers Association (JSS) decide to host another one soon. Creative events are another one of the many reasons that I love my city, the 'city that never sleeps', New York City! 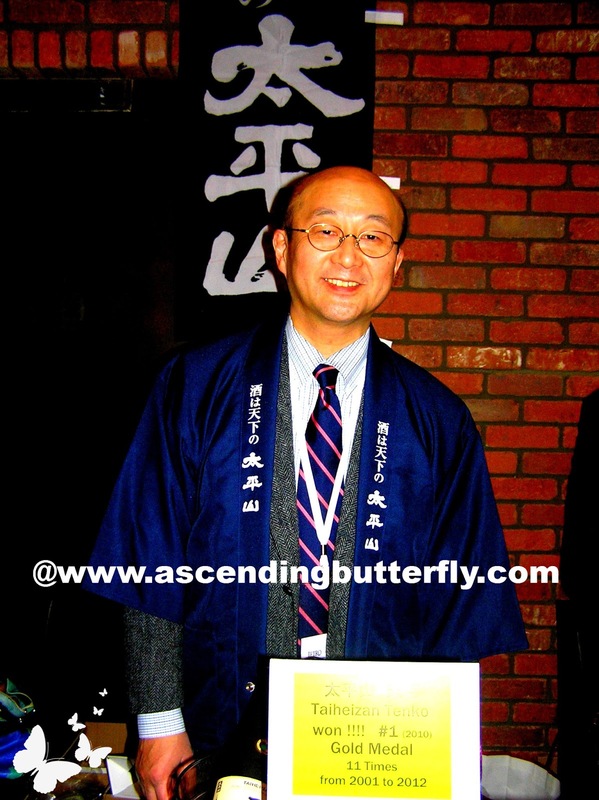 Butterfly, Are you a SAKE afficionado? What is your favorite SAKE? FTC Disclosure: This is NOT a sponsored post. No monetary compensation has been received to share our event recap, there were no gift bags, and all opinions are 100% my own. Love Sake,my favorite is Gekkeikan Plum Sake ,but reading your article makes me realize I should open my horizons!First I'll try Ginkoubai Hannya Tou Plum Sake thou. Seems like you had a great time!! @Big Happy Buddha - I love Sake also! I can tell you that Hannya is no where near as mild as Gekkeikan is, but you will definitely enjoy it! 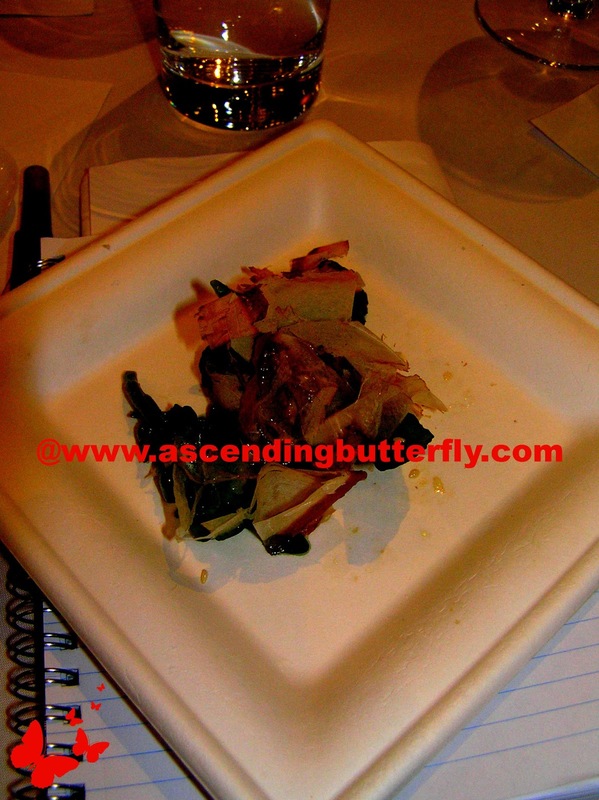 I did enjoy this tasting, I hope they do another one soon! What a fun event! The bottles are pretty, and how wonderful that you got to go! @mail4rosey - I had a great time! Wine tastings are always such fun! Thanks for visiting from Thursday's Favorite Things!